FD is a benign, usually self-limited, focal fibro-osseous disease of bone. Lesions may be single (monostotic) or multiple (polyostotic), or may occur as part of the McCune-Albright syndrome (MAS). MAS is a rare disorder characterized by a classic triad of polyostotic FD, cafe-au-lait spots, and peripheral precocious puberty. Other endocrine disorders, including hyperthyroidism and hypophosphatemia, may accompany MAS. Malignant transformation is rare (4). FD can occur at any age but primarily affects adolescents and young adults, without gender predilection. MAS occurs primarily in females. FD has been linked to activating mutations in the a subunit of stimulatory G protein, which is active in cell signaling. This mutation appears to occur after fertilization in somatic cells and has been located at 20q13.2-13.3. Mutations that occur early in embryonic development may result in more widespread or severe disease, including MAS and Mazabraud's syndrome. As a result of this mutation, GTPase activity is inhibited. There is a constitutive activation of adenylate cyclase and increased formation of cyclic adenosine monophosphate. G protein is produced by GNAS, a complex imprinted gene. Defects in this gene or its imprinting have been associated with various human diseases. Hormone hypersecretion in MAS appears to result from such "gain of function" mutations. Fibroblast growth factor 23 (FGF-23) may be involved in the mechanism of renal phosphate wasting, hypophosphatemia, and abnormal vitamin D metabolism in isolated FD and MAS. Monostotic FD is most common and usually is identified in the third decade of life. Polyostotic disease usually is diagnosed in the first decade. Most lesions of FD are detected as asymptomatic, incidental findings. Deformity of the maxilla, face, or skull may occur. 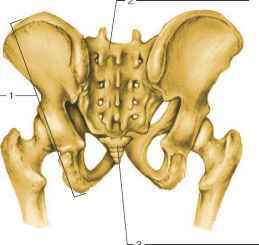 FD may present in the spine or appendicular skeleton with a pathologic fracture. Involvement of the paranasal sinuses (Fig. 2) is usually asymptomatic. Active lesions may cause pain or nerve entrapment. Temporal bone involvement is uncommon. The most common presentations are hearing loss (80%), mass (26-50%), draining ear (14-30%), otalgia (7-10%), and trismus (2.3-10%) (1). A conductive hearing loss or canal cholesteatoma may result from collapse of the external auditory canal, if it is extensively involved. The otic capsule and/or internal auditory canal are rarely involved. This involvement is associated with sensorineural hearing loss, which may be profound (5). Facial nerve involvement is not unusual (5-10%). 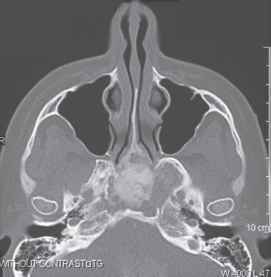 FIGURE 2 High-resolution axial computed tomography scan showing a biopsy-proven lesion of fibrous dysplasia in the sphenoid sinus. The center of the lesion has the classic "ground glass" appearance. Source: Courtesy of Edwin M. Monsell, MD, PhD. Precocious puberty, thyroid disease, and secreting pituitary microadenomas predominate among the endocrinopathies in MAS. Clinical presentations include thyrotoxicosis, acromegaly, and Cushing syndrome (6). Lesions are best evaluated by CT. Radiological studies show a characteristic "ground glass" appearance (Fig. 2). Radiolucent (lytic), radiopaque (sclerotic), and mixed types of radiographic appearances occur. A lesion might also be cystic or might have a thin bony cortex. A technetium bone scan will identify other areas of skeletal involvement. The serum alkaline phosphatase level will provide insight into the level of disease activity. The differential diagnosis includes ossifying and nonossifying fibroma, well-differentiated osteogenic sarcoma, simple bone cyst, osteofibrous dysplasia, adamantinoma, and PDB. A tissue diagnosis (biopsy) is recommended in nonclassical presentations; ossifying fibroma and osteogenic sarcoma, in particular, would be treated differently. Sequencing the G(s) a gene has been suggested as a way to confirm the diagnosis of FD in selected cases. The café-au-lait spots of MAS are described as having an irregular, trabecular ("coast of Maine") appearance, as opposed to the smoother ("coast of California") outline of café-au-lait spots in neurofibromatosis (6). Suspected endocrinopathies are pursued with appropriate evaluations. Most lesions are observed. The rationale for the use of bisphosphonates (pamidronate) to treat active, symptomatic lesions is that lesions have active osteolysis, and sometimes pain can be relieved. Treatment with pamidronate has been associated with a decrease in the elevated plasma FGF-23 levels in a few cases. Nevertheless, there are insufficient longitudinal data on safety and efficacy, especially in children, to make evidence-based recommendations for treatment of FD with bisphosphonates at this time. Canaloplasty for collapse of the external auditory canal in FD has a high failure rate (6). Appendicular abnormalities are usually corrected after skeletal maturity is achieved. Results are usually satisfactory. It is unclear whether preoperative treatment reduces the vascularity of the lesion sufficiently to be beneficial in surgery. FD is a genetic disease of soft tissue and bone. Lesions are usually self-limited. Medical treatment is available but not well validated. Surgery in the head and neck is indicated to resolve questions of diagnosis or correct deformity.